I call these arrangements song intabulations instead of vocal intabulations, because they are not intabulations of polyphonic compositions, but arrangements of songs belonging more or less to the so called monody style, which was born in the late renaissance and flourished in the early baroque. In this new style there basically was the melody ("song") and the continuo bass line with harmonic realization. The big names of 16th century lute made lots and lots of those vocal intabulations. The amount of song intabulations (in my sense) is really quite limited. My intabulations are made to my taste, to my fingers and to my 7 course soprano lute in d. I have been accompanying these songs many many times already nearly 20 years, and all these songs are my great favorities. Perhaps also someone else is interested in my solo versions? When played by a soprano lute in d, these songs sound in their original keys. Of course nothing prevents playing these arrangements by bigger lutes, too. And you are certainly allowed to embellish the repeats, etc., etc. And to understand the pieces and to find out the phrasings, you really must know the songs and especially their texts! Here in my page there are also mechanically produced midi-versions of my intabulations, just for checking "what it is", and perhaps these midi versions also help you in learning the tabulatures? The midi versions assume a "g-lute in renaissance" tuning. So the midis are 5th lower than the original compositions. There are also YouTube videos of the pieces - just raw, unpolished, direct shots. The soprano lute is made after model "Wendelio Venere", Vienna, c.1580, by Timo Kontio, 1997. Mechanical midi-version just for checking what it is. - this video was made in 3 parts because of the limitations of my old camera [...actually I should have read the manual...:-)]. Can she excuse my wrongs (pdf) (added 13.6.2008) My arrangement is based entirely on Dowland's song version, not on his lute solo version The Earl of Essex's Galliard. Awake sweet Love (pdf) (added 22.6.2008) My arrangement is based on Dowland's song. To know the melody (and words) of the song is absolutely necessary for being able to play the melody. As it is with all these pieces... In this arrangement there are several places where I let simplicity rule over complexity. Shall I Sue (pdf) (added 22.6.2008) My arrangement is based on Dowland's song. The barring is original. Also here simplicity rules over complexity. 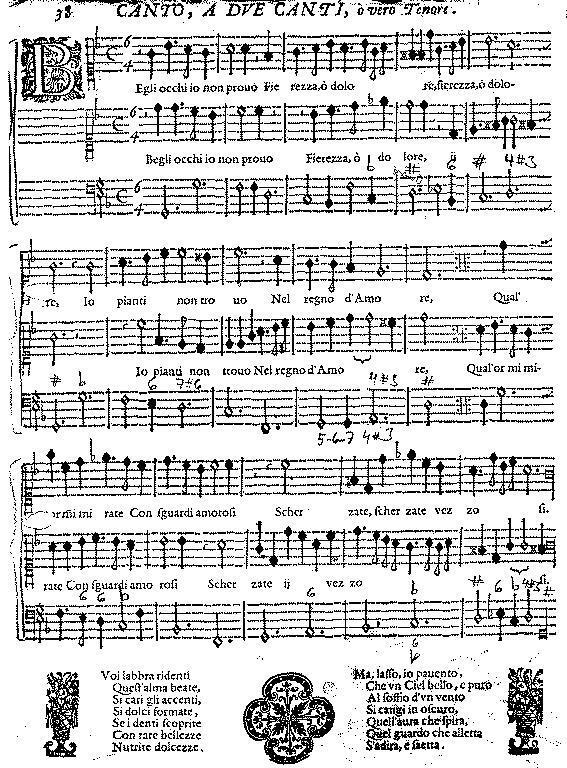 Amarilli mia bella (pdf) This is perhaps the most famous of Caccini's songs. In the original the repeat is written out because of different text. Udite amanti (pdf) Beautiful little piece still much in renaissance style. Si dolce è'l tormento (pdf) (added 3.6.2008) This song is one of many ingenious pieces composed by Monteverdi. It is extremely simple - scale down, scale up and then scale down - but combined to the words of the poem, those scales are very experessive. Compared to the Caccini Udite (above) this is really different, in spite both are "small songs in 3". This really is early baroque text-music. My version is only just simple...;-) But you really should listen the the song and understand (word by word!) the text! In case you do not know the song, it is perhaps useful to listen to my YouTube version (below), and mark your phrasings to the music. Begli occhi (pdf) (added 7.6.2008) This beautiful song is actually a duetto for two equal voices crossing here and there. In my lute solo version the melody is the voice which (to me) seems to be the more important. Usually it is the top voice, but not always. You can compare my intabulation to the original duetto. Se l'aura spira (pdf) (added 9.6.2008) Beautiful little song.